She was born and raised in New York City (Manhattan, if you’re asking), and, despite believing she’d never leave, she moved to Los Angeles after graduate film school and stayed for eighteen years—long enough to think that sixty degrees felt cold. In July 1995 she moved back east to Ithaca, New York. In January 1996, when she wasn’t chipping ice off her car, she started teaching her first two introductory screenwriting classes at Ithaca College. Since then, she has taught all levels of screenwriting, developed courses in adaptation, writing for videogames and emerging media, and, her current favorite, Story: From Cave Paintings to Emerging Media. She feels incredibly lucky to be both a writer and a teacher of writing, especially in this time of expanded narrative delivery, and finds it exciting to be engaged with stories, whether that’s teaching, watching, reading, listening to, playing, or writing them. 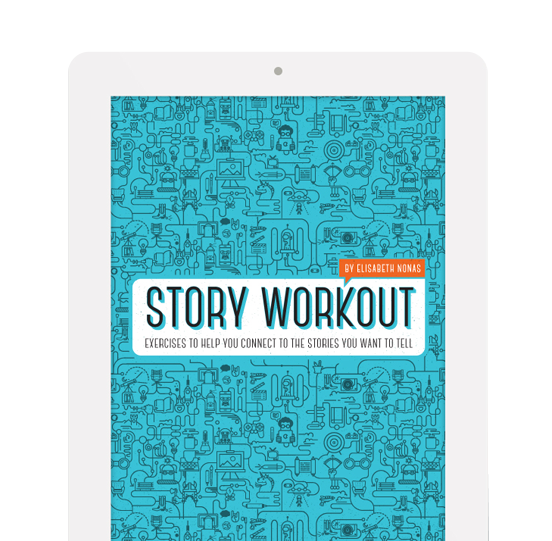 Story Workout is a fantastic resource for any writer who wants to hone their skills for film, TV, gaming, or publishing. It will put you through the paces of not just the techniques, but the mental challenges that all writers face. I can’t wait to get this in the hands of my teams and students. Elisabeth is like a yoga instructor for storytelling. Story Workout will bend your mind with new perspectives on writing, pushing you (and your stories) farther than you thought you could go. Purchase Story workout Ebook or Print Edition! This is not a self-help book. This is a book of exercises designed to teach you to trust your instincts as a storyteller. It’s not about the rules you need to learn before you break them, the 10 or 3 or 5 easy steps to writing the (your-genre-here) novel or screenplay. It isn’t about how to make millions selling what you’ve written. Plenty of books and websites and seminars already exist to help you there. The goal of this book is to encourage you to think about your own life, the kinds of stories you respond to, how they make you feel, and how those feelings relate to the effect you want your stories to have on your audience. Discovering what connects you to these stories will help you articulate what you need to connect with in the stories you create.